Maybe you have a grand idea for a bonus room — a reading nook or play space, perhaps? Maybe you’d love to cozy up to a fireplace or design that kitchen you always wanted. We provide you with ideas and options to choose from. 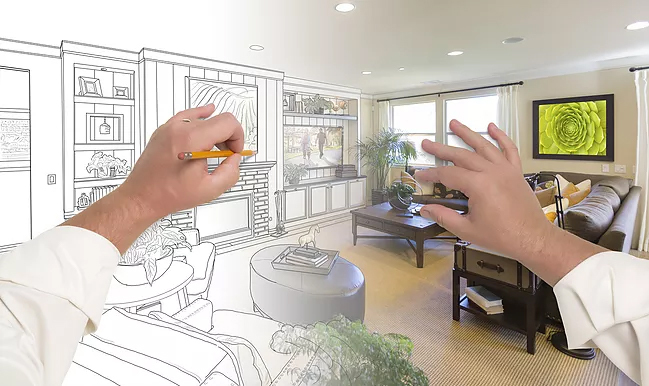 When you work with New Concept Home Buying, you work with a team of professionals who can carry out your vision for that “fixer upper” you’re buying. Our realtors will help you find a neighborhood you love, and our designers and contractors will make sure that home can be transformed from a dated house into a modern home you’ll love. The best part is you don’t need to have tens of thousands of dollars in your savings account to spend on renovations. We specialize in working with home buyers with FHA 203(K) Loans, a loan that offers not only the current value of the house you are about to buy, but also provides you with the funds you need to get your renovations and repairs done quickly. Keep reading to learn more. Maybe you have a grand idea for a bonus room—a reading nook or play space, perhaps? Maybe you’d love to cozy up to a fireplace, or design a kitchen you always wanted. We provide you with ideas and options to choose from. Our team of professionals makes finding your next home exciting! With our home improvement program, we find quality homes that might need a few updates or repairs, but are in the neighborhood you love. Our team works to bring your home to the top market value with your design preferences in mind. Homes that we select have $30,000 to $100,000 in added value once the updating of the home has been completed. You can use all the equity for your home improvements or part of the increased value and have equity on day one of buying your next home. Everything is rolled into one, easy loan: the FHA 203(K). You can work with one of our lenders and get pre-qualified in minutes to get started. Find out what you qualify for by contacting us. Our local realtors listen to what your needs are and find the perfect neighborhood for you. We look beyond what homes are in your price range. We look for homes with massive potential that can be transformed to meet your needs are and your style of living. What makes this program unique is the ability to turn a house into something special. No home will have everything you want, so why buy at the top of your budget if it isn’t exactly what you are looking for? That’s why we find you a home that is solid with good bones and has great potential in value. Once a home is found the fun begins. You can work with our designer or start thinking up ideas on your own. Our goal is to get you the highest value for the neighborhood. Design consultants will recommend custom finishes, carpet colors, cabinets, and paint colors to match your mood and personality with creative flair. Maybe you have a great idea for how you would like your home to look, but just need some help to make your dream a reality. You can work with our designer one on one to unlock your home’s potential. Choose your contractor or work with one of ours. We love our contractors and would highly recommend them, but we also know you want the freedom to choose who carries out the designs on your house. For that reason, you can select your own contractor or work with one of ours. Our design team will work with the contractor you choose to ensure that your vision is realized and everyone is on the same page.